December is quickly creeping up on us and it’s time to start prepping presents, decs and general life for the big event. We’re starting a new ‘prepping for Christmas’ series here on the blog so you can feel confident and a little smug this Christmas. For our first blog post in the series, we’ve collected 7 of our fave alternative advent calendar ideas which make the Christmas countdown much more exciting. Carry on reading to find our top picks and make sure you check out our Pinterest board, filled with even more creative advent calendar ideas. First on our advent calendar crush list is this sleek design from the blog Growing Spaces. Made from copper piping, this DIY channels Scandi vibes and adds a grown-up twist to the traditional calendar. What’s in the copper scrolls is up to you – for a creative touch, add a brush-lettered quote or a Christmassy image for a lucky someone to discover. Mary-Ann Aveline’s alternative fillable bauble tree is one of our fave handmade calendars. Decorated using four contrasting paint effects and gold leaf numbers, they’re an easy way to fancy up your daily treat. Hang them on the tree, on your mantlepiece or arrange them in a makeshift tree like above. Pick up a copy of issue 98 to find Mary-Ann’s tutorial and share your make with us using #molliemakes. If you’re a super keen crafter you could even fill each bauble with a different amigurumi character. Crochet yourself our 12 Days of Christmas Amigurumis using our free patterns, then pop them inside the bauble with a chocolate for an extra special advent. If you fancy a break from all the chocolate then try Scout Edition’s adorable stamp advent calendar. There’s a different colourful – and festive – illustration for every day of the countdown. Wondering what to do with the stamps after? Stick them on the Christmas cards and presents you’re giving out to spread the cheer (plus they’ll act as a great reminder to start the shopping and writing early). 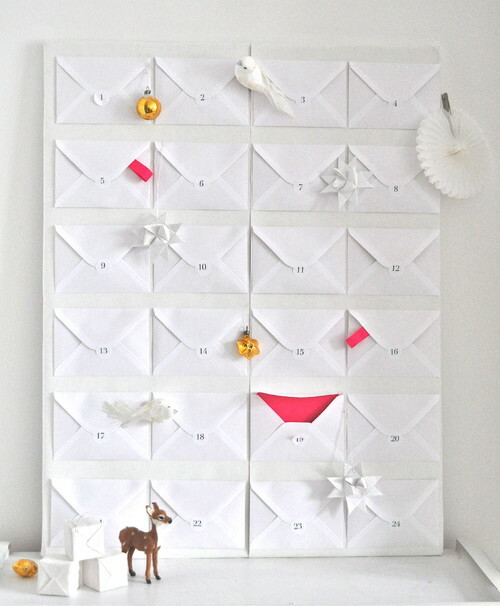 The simplicity of Sarah & Bendrix’s envelope advent calendar will be very appealing to those who’ve forgotten December is only a month away. Easy and affordable to make, you can fill these envelopes with literally anything; notes, different types of tea, seed packets, vouchers – the choice is yours. If you have a bit more time, make the envelopes yourself using different festive papers like Jacqueline Colley’s papers in issue 98. We found this one on Pinterest and loved it so much we tracked down its original makers to get the DIY. We are Scout shares their tutorial for this contemporary cal on their blog and it’s as simple and it is sleek. The idea of writing little clues on the back is especially creative – who wouldn’t want a Christmas version of an Easter egg hunt? Houseful of Handmade’s DIY calendar has that industrial chic thing going on, but it’s actually really simple to craft. You’ll be able to get this one out every year to fill with different treats. Plus, the boxes are big enough to fit loads of chocolate in, which is always a winner with us. Finally, we have the colourful queens OhHappyDay with this garland advent calendar which is so Mollie. They had us at bright hues and pom poms, but we especially love that you can string it along your bannister, around a door frame or around a mini Christmas tree. Let the countdown begin! For more handmade Christmas ideas subscribe to Mollie Makes. The mag is full of creative gifts and styling ideas for the festive period.